Augusto Carosi, CRE, is a founding partner and CEO of Desarrollos lnmobiliarios y Gerenciamiento de Emprendimientos SRL. His experience in the real estate area was developed by his almost 7-year activity in the international company U.S. Equities Realty in Argentina, Chile, Venezuela, Colombia and Panama. His last position held at U.S. Equities was as Managing Director for Latin America, being in charge of leading the company’s establishment in the Caribbean region. In 2002, Carosi was put in charge of launching U.S. Equities offices in Santiago de Chile. He oversaw assignments for several clients as Banco Santander-Santiago, ABN AMRO Bank, BankBoston, ENEA and CORFO (Government of Chile). He created the Corporate Services division, including services such as brokerage and project management. He was Project Manager for the U.S. Equities team in Argentina with responsibility for the services and infrastructure managing operations of BankBoston, with more than 120 premises, and 140,000 square meters in the portfolio. Augusto graduated from the University of Buenos Aires as an Industrial Engineer. He can speak fluently Spanish, English and has an intermediate knowledge of French and Portuguese. In 2015, Argentina had a gross domestic product (GDP) of U.S. $586 billion. It is the third largest economy in Latin America and among the largest in Emerging Markets. In accordance with the latest census (2010), it has a population of 40 million. Argentina has abundant natural resources in energy and agriculture. In its territory of 2.8 million square kilometers, it has extraordinary fertile agricultural land and an enormous potential in renewable energy. It is a leading country in the production of foodstuffs, with large-scale industries in the agriculture and livestock sectors. Moreover, it offers great opportunities in some manufacturing sub-sectors, and in the innovating services related to high technology. The country’s economy experienced diverse courses in this contemporary age. We can state that towards the end of the 19th century, and the beginning of the 20th, Argentina followed an agro-exporting model. According to Angus Maddison,3 this country, prior to the 30s crisis had a per capita income which placed it in the 11th position among the world’s countries. After the 30s crisis, a process of industrialization through import substitution was implemented, with periods of major and minor intervention by the state. Between 1930 and 1986, considerable political instability, caused by a succession of democratic and “de facto” governments, prevented sustained economic growth in the industrialization process and in the planning of state development policies. With the return of democracy in 1983, there occurred three successive economic crises. The grave national crisis of 2001 was followed in 2003 by a populist government, which ruled during the last 12 years until the end of 2015, leaving an economy closed to the world, with 30 percent poverty indexes, and extensive energy and housing deficits. After this introduction, we will deal with the housing deficit, and the opportunities open to developers in order to reverse the process. The housing deficit in Argentina, depending on the source consulted and considering all socioeconomic levels, is approximately 2 to 3 million homes. 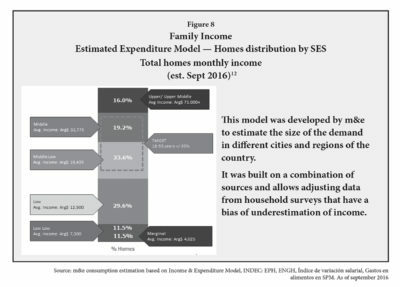 Figure 1 shows a study carried out by the Argentine Chamber of Construction (Cámara Argentina de la Construcción — CAC), where we can see the categorization of housing deficit in Argentina. If we take in consideration the housing deficit by constructive quality (both irrecoverable and recoverable), we reach about 2 million houses. The City of Buenos Aires and its suburban areas represent 60 percent of this deficit. 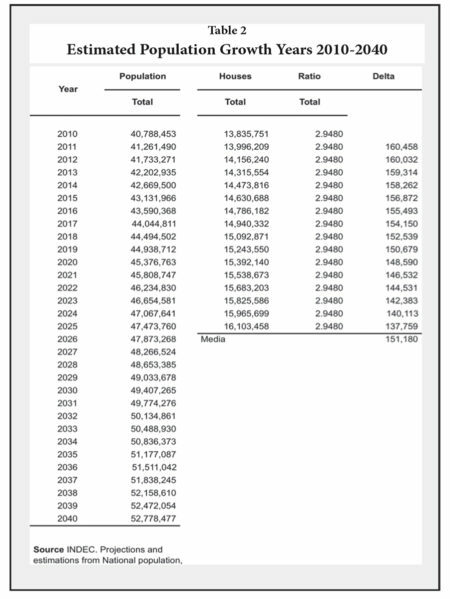 Additionally, it is estimated that demographic growth requires the building of approximately 150,000 homes annually, to keep up with the present housing deficit, as shown in Table 2 Estimated Population Growth. Years 2010- 2040. Reducing the existing housing deficit is a political decision taken by the present administration. 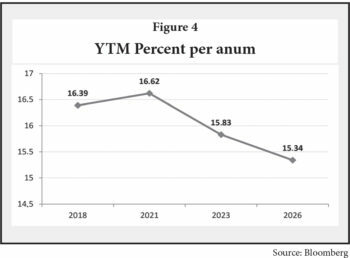 In order to achieve this, it is imperative that the current inflation rate of 40 percent, reported during the past 12 months, be lowered to a manageable rate below 10 percent per annum. In this sense, the horizon seems to be clearing. The National Institute of Statistics and Censuses (INDEC) (www.indec.gob.ar) published the Greater Buenos Aires region CPI index for August 2016, which rose 0.2 percent m/m, far below July 2016’s 2 percent increase. Looking forward, the annual inflation rate has been forecast at 21.2 percent for 2017,6 slightly above the inflation target set by the Central Bank of Argentina for 2017 (12-17 percent), but in line with the Government’s plan to lower inflation (see Figure 3). In line with these inflation expectations, the markets have reacted positively to the first offers in years of National Treasury bonds denominated in Argentine Pesos. In the last 60 days, the government has issued bonds worth U.S. $10 billion with maturities ranging from 2018 to 2026 at decreasing yields, as depicted by the following yield curve for bonds in ARS. This is outstanding. If the process were to be continued, we can consider that funds for the building of homes will be available at low rates. On the other hand, negative rates in the world are nothing new to investment funds. During August 2016, 52 percent of the world’s U.S. $25 trillion outstanding bond issues offered a negative rate. 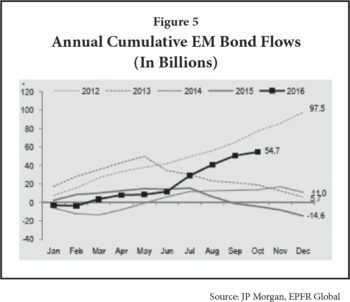 For this reason, capital flows are returning to Emerging Markets; 2016 could receive U.S. $60 billion in new flows after several years of low or even negative flows. Mortgage loans. State-backed credit plans. “Procrear” program. The relationship between mortgage loans vs. GDP in Argentina was 4 percent towards the end of the 90s, whereas currently it is closer to 0.5 percent. In other countries in the region, the figure is higher. Chile leads with a ratio of 18 percent, and is followed by Brazil and Colombia at 5 percent. In 2013, in Argentina, one could purchase Treasury Bonds of the Province of Buenos Aires, which yielded an annual rate of return of 24.75 percent in U.S. Dollars. Mind you, this a bond issued by a province. Therefore, what is the rate payable by an individual in order to purchase a home? The rates of indebtedness offered by the Government made the development of a mortgage industry impossible. The result is that in Argentina you either own a home or become a tenant; few have mortgages on their homes. With the new administration, this began to change. 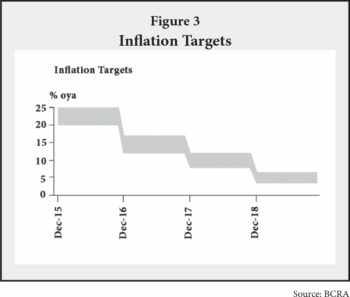 As mentioned previously, the rates at which the government is starting to finance itself in local currency foreshadow a one-digit inflation in the coming years. Moreover, the government is launching of mortgage credits for the private sector. For example, it recently introduced a program of mortgage credits for housing financed by the National Pension Fund (“Procrear” program — “Own Your Home”). This plan will allow the financing of homes through State subsidies of up to 20 percent of the total amount of credit granted. Rates of interest would be 5 percent above inflation, with terms not exceeding 20 years. The maximum value of the loan will be U.S. $100,000 per home (ARS 1.5 million), and it will be directed towards households with a net annual family income of up to U.S. $24,000. For example a family with an annual income of U.S. $13,000 could be granted a U.S. $60,000 loan; the annual servicing of this loan would be U.S. $3,200 during a period of 15 years – i.e. a cost/income ratio of 25 percent which is a standard in the industry. Moreover, this U.S. $60,000 loan plus the State bonus of U.S. $20,000, would enable the family to purchase a suburban home comprising three rooms built on a 300 square meter plot of land. While there is no information on housing stock available, the cost to build a house is roughly U.S. $60,000 (U.S. $800/sq. m.). Clearly, the Government is attempting to stimulate the demand-side rather than offer-side. In the past, the government used to build homes for the poor, and resources were going to build homes (the offer-side of the market). Now, the government is giving the funds that used to go towards building homes directly to the individuals so they can decide where they want to buy their home. The offer-side is a reversal of the policies of former governments where bids were made for large housing projects, with higher costs, and where the construction firms profited by non-compliance of completion terms, quality, and without taking into consideration the needs of the final beneficiary. This is designed to limit speculation and prevent the risk of a housing bubble during the coming 15 years — the estimated time it will take for the deficit to disappear. This is different from other markets (like the American post sub-prime, or the Spanish soft credits for 2nd and 3rd homes). Why? Merely because whoever purchases this type of home will be the final user. He will be the inhabitant. In the case of investors, it will not be a product for resale at a profit during a short period of time, for those looking for making a quick profit. With a rate of inflation of less than 10 percent, the financial system will again be able to offer mortgage loans, such as 20 years ago, when one of every two homes sold in the City of Buenos Aires was purchased by way of a bank mortgage. This way we will enter a virtual circle wherein private developers will compete by way of offering the best cost/quality product, and the buyer will be offered a choice. The chain of corruption, whereby the state was overcharged for low quality work, would cease, and greater efficiency would be achieved because private capital is profit-conscious and must compete. The market that unfolds at this new stage falls within the sector of those households that rent, are not overcrowded, and pay monthly rents of U.S. $266 to U.S. $400. The suburban homes within this market are valued at U.S. $100,000. As we can see in Table 6 above, considering that both groups (tenants and owners) could pay common expenses, we can assume 24 percent of tenants’ expenditures are going toward rent. In targeted families with a monthly income of ARS 25,000 (U.S. $1,666), monthly rent is about ARS 6,000 (U.S. $400). These families will be able to pay a mortgage for a ARS 1,500,000 (U.S. $100,000) home — at the same cost as they would to rent a home. The great change lies in the fact that a family wanting a home of this description had to pay a monthly mortgage of U.S. $667 to U.S. $800, due to the combination of high interest-short term mortgages, whereas a rental contract for a similar home, on a monthly basis, was found to be 50 percent less. For this very reason, people were unable to purchase a home on credit. Nowadays rental contracts and mortgage payments have started to even-out. This is the great difference, and it enables a large sector of the population to be homeowners. Are there sufficient homes to cover this deficit? Definitely not. In recent years all home development concentrated on the building of apartments and gated communities for the high and higher middle classes; they were able to buy by way of cash payment transactions or through short term financing (3 to 4 years), where a group of investors (or final users) will create a specific trust to develop a real state project (apartments or lots), paying cost price during the construction period. 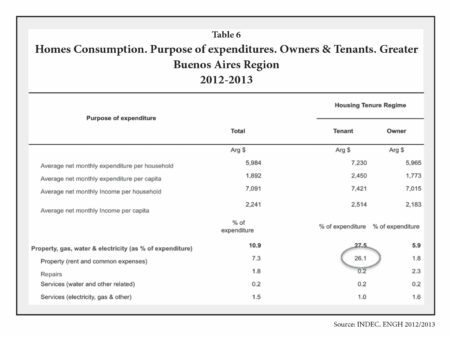 This means the buyer is paying the real cost of the house/lot/apartment during the construction period plus the developer fee (very common in Argentina). What will be found lacking is land for suburban developments in locations with infrastructure and public transportation. The last suburban trains lines were built by British companies until the nationalization occurred in 1948; and Metro lines in the City of Buenos Aires were not increased in any station from 1945 to 2000. Whereas bricks can be manufactured without limit for a minimal investment, infrastructure served land cannot. What is most important to any developer is the purchase of land. Here is where a major upside surfaces, and where the struggle between the various investors comes to light. Nearness to public transport (ideally rail services). Rural land close to urban districts in order to produce usage changes. Have set acreages in order to achieve scaled economies during urbanization, thus attracting the interest of municipal and provincial authorities. This would cause a definite settlement in the district. Available land is limited and values will rise markedly within the short and medium span. Whereas the City of Buenos Aires could grow in three different directions (south, west and north), a developer group, which I have been a part of, has carried out a thorough study with in-depth analysis made by Marketing & Estadística SRL with a major emphasis on the southern areas of Greater Buenos Aires; this, we believe, would generate increased values for various reasons outlined below. This has been relegated for many years with respect to infrastructure and access roadways to the City of Buenos Aires. 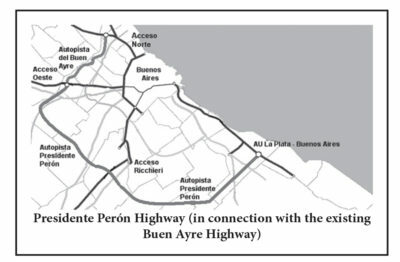 The extension of the Buen Ayre highway (Presidente Perón highway) is in full swing and will reach Puerto La Plata, at Ensenada (the first Port of Rio de la Plata), thus creating a new ring highway for Greater Buenos Aires in-between the rings of General Paz highway and Route 6. It is estimated that work on this project will be completed by the year 2020 (see map). The “General Roca” railway (“Constitución” station to “Alejandro Korn”) branch line has recently been extensively renewed, and the service is operated with first class rolling stock. There are still rural areas in the vicinity of the urban build-up (in many cases separated only by a roadway) which offer the possibility of achieving a change in land-use. In the nearby districts there are 580,000 households, which constitute 12.5 percent of homes in the Province of Buenos Aires. It is one of the areas of major density and, what’s more, has a great availability of rural land ready to be transformed into urban locations. The distance from downtown Buenos Aires to Alejandro Korn is less than the distance to other areas such as “Escobar”, “Pilar” or “General Rodriguez”; the latter shows a greater urban development. The urban area in this case, and in areas in the surrounding vicinities, becomes rural land within 20 blocks from the railway tracks, in most directions. Create a full-scale housing solution for the middle class and lower middle class; which have been, to date, largely neglected and can be considered the major social stratum in Argentina, as shown in Figure 8. 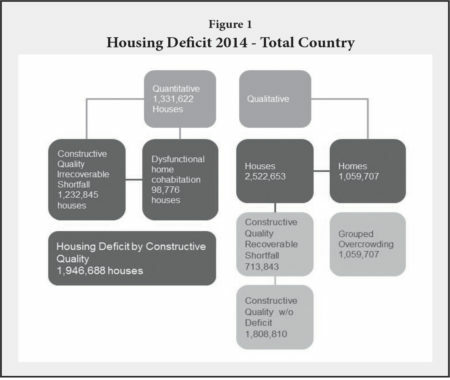 Develop housing, such as has been done in other countries, in order to produce a lowering of the housing deficit (See Figure 1). It is of fundamental importance to develop an identifiable quality brand that later will sell itself based on the experience of the consumer. A low-cost house should be developed to offer quality finishes, be energy efficient and absolutely rational in its conception and building process. Home sales, especially involving this type of housing, can be costly if commissions, notary public fees and other fixed costs are considered. To minimize incoming and outgoing expenses, thought should be given to the possibility of expanding the house efficiently whenever an extra bedroom or playroom becomes necessary. Housing development is a must in order to furnish the consumer with a product that has a commendable design. The building of a home is a commodity with similar returns in any part of the world. However it is necessary to build the house and sell it, in order to obtain a real profit which is brought about by the transformation of land use. Rural land is today going for U.S. $6 per square meter. If the use of the land is brought about efficiently to a usable 60 percent (taking into consideration requirements for roads, public areas such as parks, schools, community services, etc. ), the cost of saleable land would be U.S. $10 per square meter. The cost of building on rural land in order to transform it into urban property with streets, electrical services, drinking water, sewage disposal, etc. comes to a net of U.S. $25 per square meter of saleable land. The final cost of the plot would be about U.S. $35 per square meter. Nowadays, in the analyzed area, plots with lower quality services and a similar location are sold at U.S. $70 per square meter. The yield is approximately 100 percent. In forthcoming years Argentina will certainly be a hot market. Angus Maddison (1926-2010). British economist who dedicated his life’s work to reconstruct the size and rate of growth of the global economy since the birth of Christ up to the present time. Cámara Argentina de la Construcción. Lago, Fernando. “Pensar el futuro: construcción y desarrollo 2016/2020.” 1ª ed. Adaptada. CABA, FODECO 2015. ISBN 978-987-1915-64-4 and “Estimación del Déficit Habitacional Argentino” Ing. Daniel Galilea; Arq. Guillermo Tella. Source INDEC (National Institute of Statistics and Censuses). Projections and estimations from National population, homes & houses Census 2010 Results: www.indec.gob.ar. Nicolás Dujovne, economist. See: http://www.lanacion.com.ar/1947685-menos-inflacion-y-credito-mas-barato-claves-del-porvenir. Source: Torcuato di Tella University, based on data furnished by the Central Bank of Argentina. Marketing & Estadística: “Territorium m&e: Sociodemographic Analysis of Alejandro Korn Corridor”, September 2016., See: www.marketingyestadistica.com.